Ditch the Diet Dogma and do what's best for your body at this point in time. There are hundreds of different dietary protocols that serve their purpose, based on an individuals current state of metabolic health. It's important to understand that bio-chemical individuality dictates what your body needs on a cellular level, not what you think you need. Explore each of these theories, and allow your body to do the talking. The best part about ditching the diet dogma? 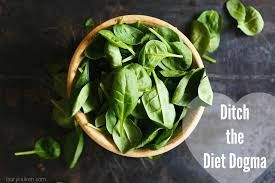 When your body is healthy, in many cases all of these diets can be mixed and matched for the rest of your life, allowing your body to dictate what he/she really needs on a daily basis. This allows for flexible freedom, restored health and sustainable weight-loss that lasts a lifetime. A Fertility Diet Plan is an effort to blend the wisdom of Chinese medicine with groundbreaking western research to help women and couples learn what and how to eat to optimize fertility. Links between diet and depression were misunderstood until recently. Many factors contribute to depression symptoms, and there are dietary considerations for each of them.